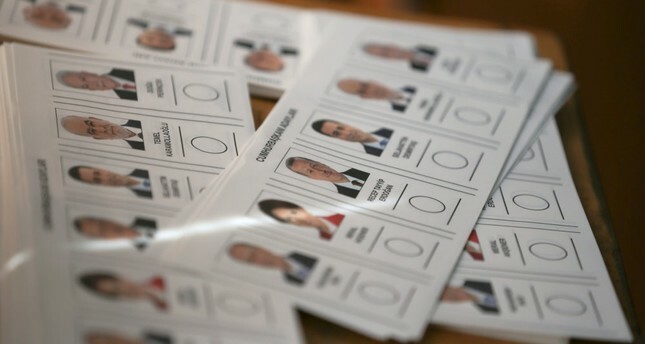 Ballots for Turkey's presidential election are pictured at a polling station in Ankara, Turkey. If someone with no knowledge of the recent elections period in Turkey was asked to look over the BBC's Turkish service in order to put a finger on the pulse of the ongoing in the country, he or she would most likely be puzzled for several reasons. Turkey's general and presidential elections, that capped off just yesterday, were being covered by BBC Turkish for a sufficient amount of time, with a series of man-on-the-street interviews, news analyses, live coverage and videos. All those pieces would be more than enough to understand the recent political aura in the country. This is of course true for those who could live with biased reporting. As for anybody seeking impartial coverage of the election period, BBC Turkish is sadly not the address. Out of all the methods that the BBC Turkish resorted to, consciously or not, the one they relied on the most was - to put it in layman's terms - gushing over all the presidential nominees except Erdoğan. The main opposition Republican People's Party's (CHP) candidate Muharrem İnce was the most reported candidate. His pictures were constantly used where he waves and greets crowds accompanying him in separate rallies, with a smile on his face or a bouquet of flowers in his hand to toss to his supporters. The night rally that İnce held on June 9 in Istanbul's Kadıköy district was one of the many examples in which BBC Turkish used a picture of him opening both of his arms, looking far, far away, and right above the picture a caption read, "İnce repeated the message of peace and consensus he had given in previous rallies." Even the tweet İnce shared on June 17 to mark Father's Day with two pictures, one showing him and his father and the other one of him and his son, with a poem on parenthood, was on the BBC Turkish's web site. The romanticization of the CHP's candidate moved much beyond such pictures of happiness in the following days, as expected. An overemphasis on the high attendance numbers at İnce's rallies is what BBC Turkish does to try and show how much strength the opposition candidates were gathering against Erdoğan, whose name the BBC Turkish service prefers not to cite as much. BBC Turkish started coverage on İnce's rally on June 22 in the capital Ankara hours before the rally itself. Live coverage began with the BBC reporting the square was "pretty crowded" and "double check points were formed in four arteries to enter the field." The whole series of the coverage was shared with people that joined the rally. BBC Turkish's official Twitter account shared direct quotes from İnce during his Ankara rally where he said he has "never seen such a jam-packed crowd," and warned of a possible stampede. The crowd was shown in videos on the Twitter account whereas supporters at the rally were filmed saying "İnce will be the victor." The number of the huge crowd, in İnce's estimates, was around 2 million. It turned out on Saturday, however, that the exact number was 75 thousand, as the city's police headquarters later announced. A day before the Ankara rally, İnce held another one in CHP's stronghold of İzmir where, in BBC Turkish's words, "a flood of people" was seen. The CHP announced the attendance as 2.5 million people. The BBC Turkish agreed and shared the information with a note on the Twitter, showing that some European countries such as Macedonia and Slovenia had smaller populations than İnce's İzmir rally in Gündoğan Square. The BBC's reports were saying people from all walks of life were at the rally, and they were all asking for "peace." Maybe true or maybe not, but it is not that easy to be sure when there is, in blunt terms, such a hyperbole in numbers. İnce was not the only candidate BBC Turkish gave wide publicity to. The Peoples' Democratic Party's (HDP) presidential hopeful Selahattin Demirtaş, who is currently in prison on charges related to membership, leadership and committing crimes for the PKK terrorist group, is another name that the news service gave precedence to in its election diaries, although to a lesser extent. On June 17, Demirtaş made an election speech on state broadcaster TRT in a scheduled 10-minute address, and the BBC Turkish reported that speech with the title, "Selo Başkan received a standing ovation over his election speech on TRT," and the article said pro-HDP groups chanted slogans in support of Demirtaş. A whole range of tweets under "Live" notice was shared by the BBC Turkish, with quotes from Demirtaş who claimed he was put in prison because the AK Party was afraid of him. A romanticization was granted for Demirtaş this time, whose tweet like İnce's, was shared on the BBC's twitter account with a screenshot that Demirtaş took from the movie "Brave Heart." As for the rallies that the HDP held in different cities of the country, BBC Turkish played the vocal role again. The rally in the southeastern province of Diyarbakır on June 20, for instance, was the most crowded rally, namely the "Big Amed Rally," that the HDP staged in the last 3 years, it reported. Tens of thousands of people attended at the rally in İstasyon Square, with long lines of people filling the roads, the report continued. And a day before June 24, in the same wise, BBC Turkish continued to inform its readers with "huge" crowds from the HDP's rallies in Van and İzmir provinces as well as CHP's rally in Istanbul. In the exact opposite manner İnce and Demirtaş's electoral journeys were reported, President Erdoğan's rallies were covered by BBC Turkish with blatant negative undertones. Attendees have gathered in the rain ahead of the Yenikapı rally Erdoğan will address. For the rally that more than 1.3 million supporters took part in, the BBC Turkish favored to say nothing. Before yesterday's elections, the chairman of the AK Party, President Recep Tayyip Erdoğan held 35 rallies in total in a span of 27 days. However, BBC Turkish reported only a couple of those huge gatherings, only when they needed a reaction to the other candidates. Scowling, angry-looking, "hands-in-the-air" snapshots of President Erdoğan were attached to almost every single article the BBC Turkish shared on its website or social media. An article it took from the Independent with the headline, "There is growing hope that historic election will end Erdoğan's iron-fist governance," was shared on BBC Turkish's twitter account right after a piece it took from Daily Telegraph and shared with the caption, "Muharrem İnce: Son of a truck driver fires up opposition to Erdoğan's rule." In the second article, the BBC shared a picture of İnce with rolled pant legs walking along the beach. Did they share anything unbiased about Erdoğan? No. They did however go on to share these articles, "Bully-boy Erdoğan is a threat to Turkey - and the world," by The Guardian's Simon Tisdall and "Erdoğan pins his poll hopes on potato price curbs," which was published by The Times. They shared these articles with either his pictures on banners, or some of his less appealing pictures that were taken while he was speaking to a crowd. The selections were palpably made on purpose. You can't find a single neutral picture that the BBC used - they were all chosen carefully to make Erdoğan look bad. When referring to the chairman of a political party that has been in rule for 16 years, there has to be more to talk about other than the failures of the party. Nonetheless, BBC Turkish has remained stuck in the circle of prejudice against the AK Party and Erdoğan. They covered his election rallies only as sharp reactions to the opposition's deeds. "Erdoğan asked in a rally in Kartal, Istanbul: Have you heard İnce's profanity-ridden conversation with a public servant?" was the headline the news site used while reporting on one of President Erdoğan's rallies. Was that the most important thing he said? Were there no other topics the president mentioned in that rally, what about his pledges he rolled out, were they not significant at all? While minute-by-minute coverage of Demirtaş's e-rally was shared online, most of Erdoğan's rallies were disregarded, except those that were used against him. With the handle "200,000 Syrians were sent back home," the news service covered President Erdoğan's Gaziantep rally, where he talked about a plethora of other issues but all were ignored since BBC Turkish might have found uncriticizable. Let's just call a spade a spade; BBC Turkish does not want Erdoğan to receive public support. It has not broadly covered the manifesto that his party announced, the election declaration that it has unrolled, the mega-projects it has introduced, the future and ongoing ventures it has undertaken - such as mega industrial zones, reading cafes, opera halls, defense projects, airports, highways, bridges, tunnels and more. Among the few reports that the BBC Turkish published was about the changes Erdoğan announced about the government structure. The governing system will be changed to a presidential executive system following the elections, Erdoğan announced and the BBC Turkish covered this time. A repeated question the BBC posed was whether the ruling AK Party would come out victorious in the districts and the cities it won before. In Denizli for example, the BBC Turkish's pre-election report asked in its headline, "Will Denizli pull off a surprise like it did back in April 16 referendum?" Explaining in the lead sentence that the AK Party got "No" votes in Denizli in the constitutional referendum in 2017, the report signaled that the ruling party might face the same fate again. CHP and the Good Party (İP) have drawn intense interest by voters, the report went on. With no arguments as to how the ruling AK Party could take more votes, other reports similarly sought an answer to the same question. Ankara's Elmadağ is one of the five districts from which AK Party could not emerged the victor in the referendum, another piece published on June 20 pointed out, but no answer was given to the question, other than a statement by an interviewee, who said, "We are all afraid, our children will apply for jobs. We could get into trouble." Some interviewees said they regretted voting for the ruling party, while others found everything expensive, a video shot in another district of the capital city Altındağ, where the AK Party got a majority of their votes, showed. Fortunately, the video, without much favoritism, gave place to those who also found the party rather successful. One of the strongholds of the AK Party, Trabzon, is another province the BBC reporters covered with the question, "Will AK Party lose one MP in Trabzon?" This time, unlike the other open-ended articles, the article published on June 20 gave a clear prediction, "AK Party will be the victor in Trabzon province once again, and President Erdoğan will get most of the votes for the presidency." However, the question of whether the party will guarantee five out of the six parliamentarians, as before, is caught among a mix of yes's and no's, mainly the latter. For the metropolis Istanbul, a street interview published online on June 21, mirrored the support of the AK Party voters to the party and its chairman. On the other side, however, some people criticized the ruling party, citing stagnation in the country's economy. Up to this point, the coverage seems impartial, with those favoring the AK Party's rule versus those eyeing a change. But then, BBC Turkish's notes it shared together with comments of people finding fault with the way AK Party has managed the economy prove the opposite. The notes say "The Turkish lira tumbled 24 percent against the U.S. dollar this year," "Inflation runs at 12.5 percent," and "The unemployment rate saw 10.1 percent in March." What about what the AK Party has achieved? After all these examples, it's pretty easy to say that BBC Turkish addressed a limited audience - anti-Erdoğan and anti-AK Party - at the cost of journalistic professionalism and ethics. BBC Turkish is not likely to change its tone after this article, however, such an analysis, if nothing else, should serve as a reminder to BBC headquarters that its news service in Turkish merely tarnishes the British broadcaster's image. If the BBC is actually concerned about its credibility, it should pay more attention to this sort of journalistic malpractice.